Posted on August 10, 2011 by Albert G.
Sometimes I fall into a bit of a trap. There are so many beautiful background papers out there (and in my collection), that it gets a bit easy to fall upon a wonderful printed paper for a mat to a card. Now, I’m not saying there is anything wrong with using papers from your favorite collections and/or lines. I certainly love doing it. But sometimes, I forget that I can “make” my own backgrounds by repeating a stamped image. I’ve previously stated that I love geometric patterns and intricate scroll work. There is something about the Art Deco period that tugs at my soul. Whether it’s jewelry, home furnishings or artwork–there’s something about a repeating pattern that speaks to me. This repeating pattern motif is why I think I drawn mosaics and tile work so much. 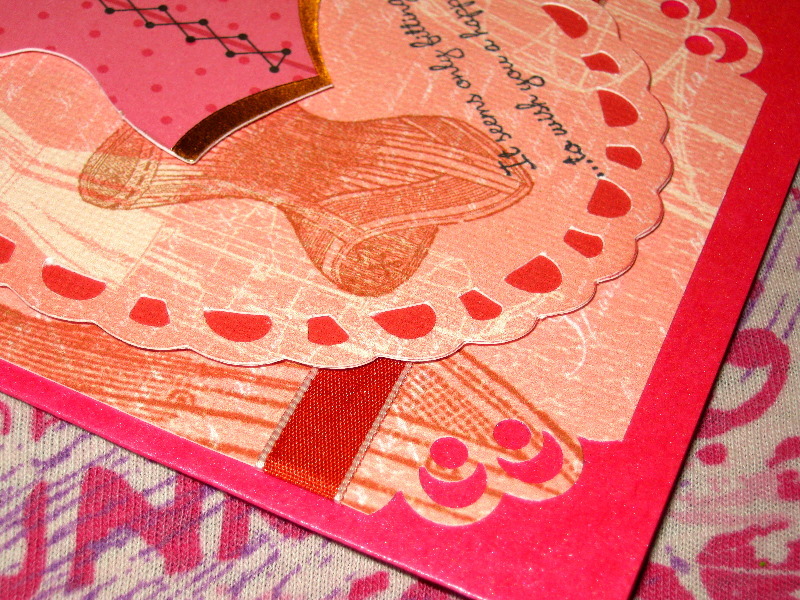 This card was inspired by one of the stamps in Papertrey Ink’s “Giga Guidelines” acrylic stamp set. Using the perfectly co-ordinated Guide Lines II grid sheet cardstock, I stamped the image repeatedly in Memento Rich Cocoa ink. After letting the ink dry, I went back in using another stamp–from Papertrey Ink’s “Dot Spot” medallion set–and their Vintage Cream pigment ink to stamp over the centers of each element. I really like the effect achieved by stamping the pigment ink over the Tsukineko ink. It’s not glaring, but creates a semi-gloss look as you move the card around a light source. 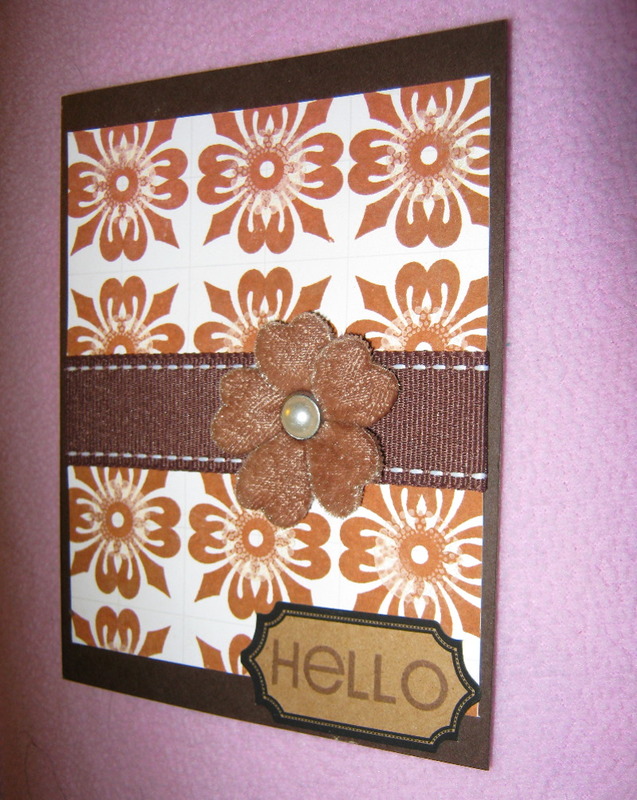 The card base was made from some Stampin’ Up! cardstock in Early Espresso. 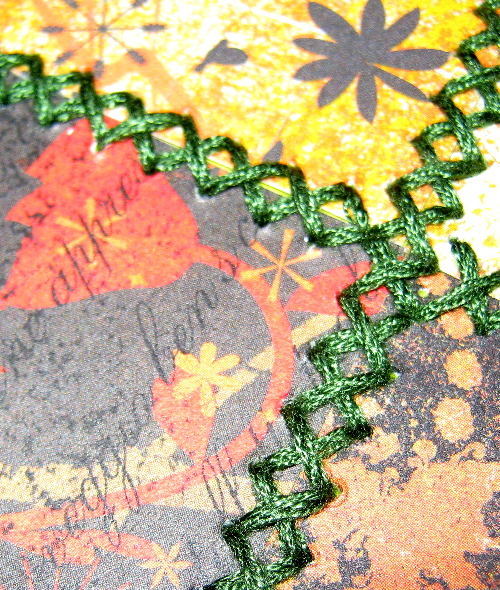 The ribbon with stitched detail is also Stampin’ Up! (in Chocolate Chip). 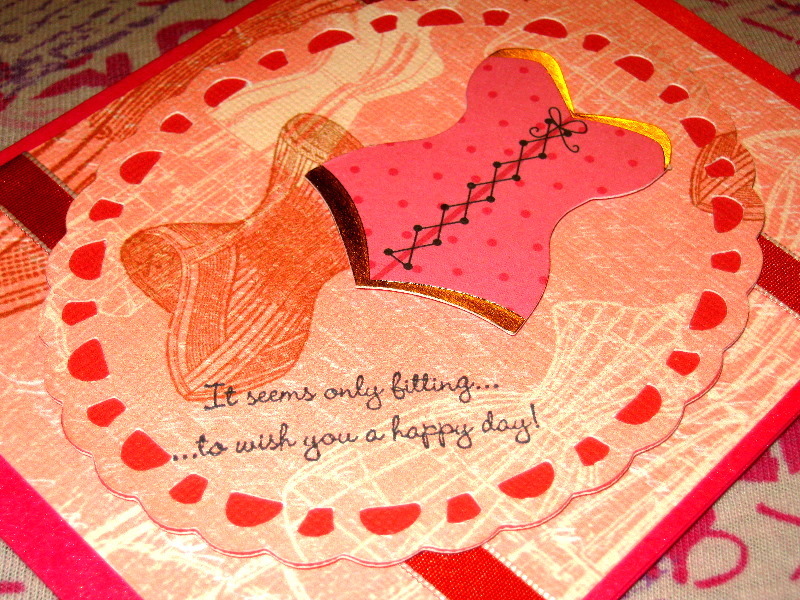 The sentiment was made from a Maya Road Kraft tag and another Papertrey Ink stamp. 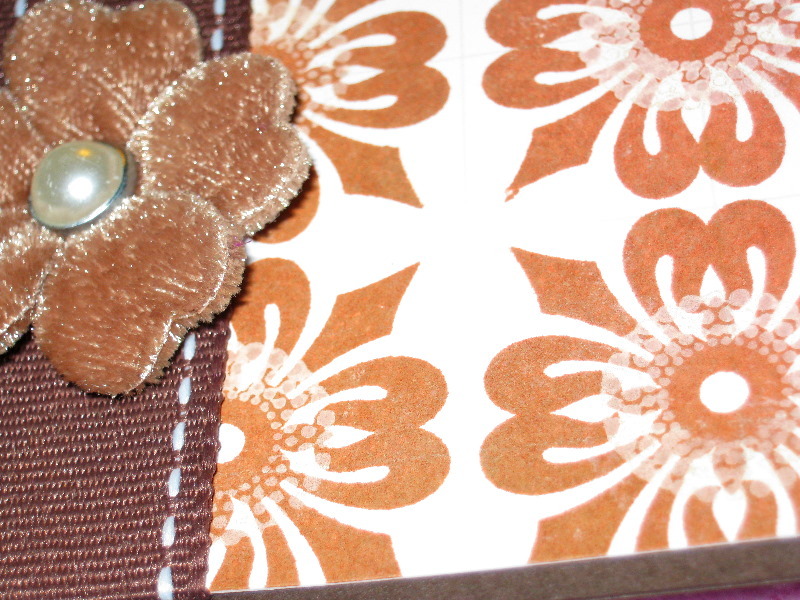 For the final touch on the cardfront, I used a vintage Velvet Poppy from Creative Charms in a Vintage Brown color. 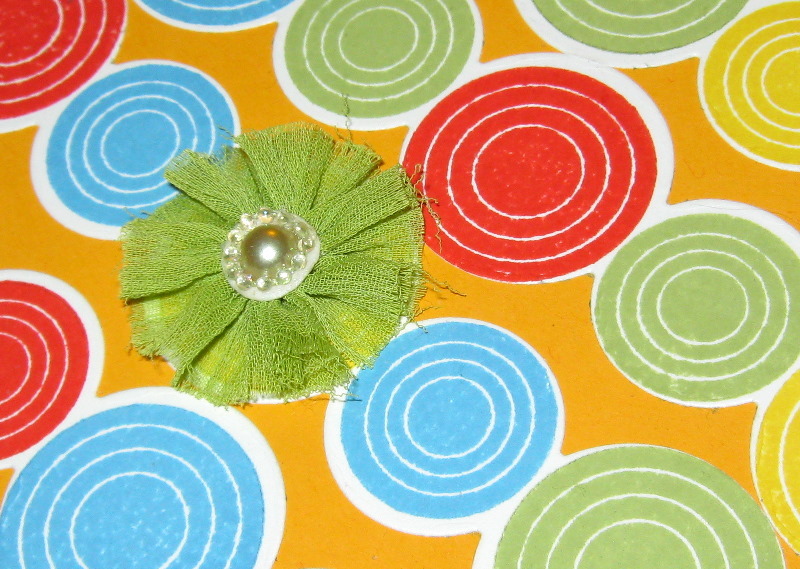 The flower attaches with a pearl center brad, so I used a paper piercer to secure the brad through both the ribbon detail and the card mat. Because the cardbase cardstock is so dark, I needed to added a place for a note inside. 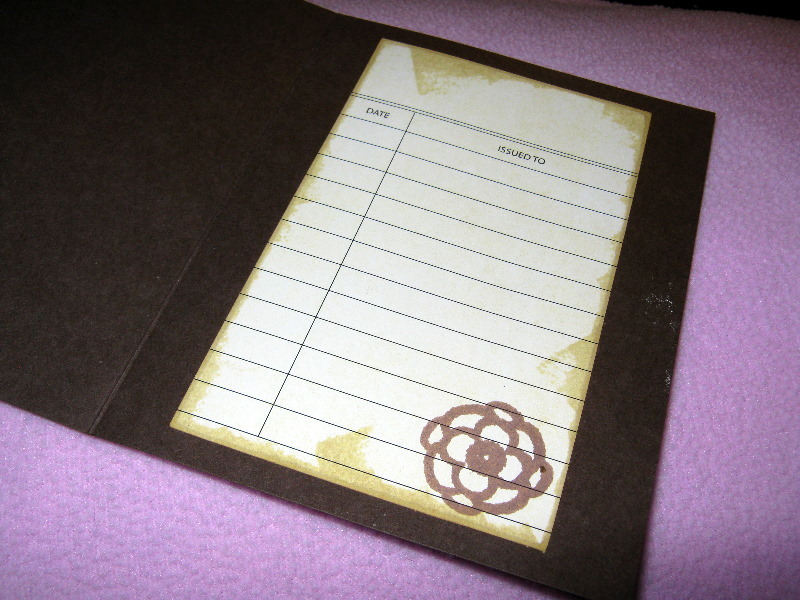 I used a blank library card and Papertrey Ink’s Vintage Touch tea dye to distress the card and stamped a little floral element in the corner. Posted on May 5, 2011 by Albert G.
Today’s card project is a bit different for me…in several ways. The genesis of the idea came from an image that I absolutely fell in love with on the new Cricut Imagine Colors & Patterns cartridge entitled “Heirloom”. The image is a terrific collage print featuring vintage dress forms, wire dress forms and corsets and is done in a palette of corals, dusty pinks, creams and carmine red. It’s an ultra feminine piece of artwork–and a terrific find with the hot crafting trends of vintage shabby chic and steampunk regalia. One of the very first things I did was print out a 12″ x 12″ sheet of this paper on some textured white Bazzill cardstock. I set it aside for a bit trying to decide where I was going with it. In the mean time, I was exploring another soon-to-be favorite Cricut cartridge called “Elegant Edges”. This is a must-have cartridge for those of you who are always looking for decorative frames and picture mats, as well as unique journaling blocks. As I was exploring the oblong frame set to find a shape for a card front, I was inspired to use my Cricut Imagine to combine the artwork of “Heirloom” with the scalloped open-detail oblong frame from “Elegant Edges”. I used the color palette from “Heirloom to print the backing solid color shadow frame for my scalloped piece. 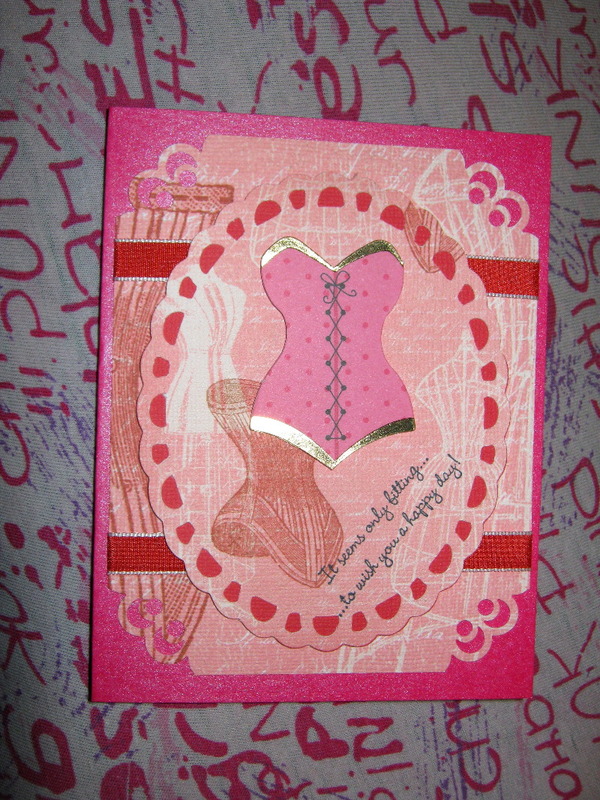 Once I had a mental image of what I wanted, I started building the card using some red mica cardstock as the card base. 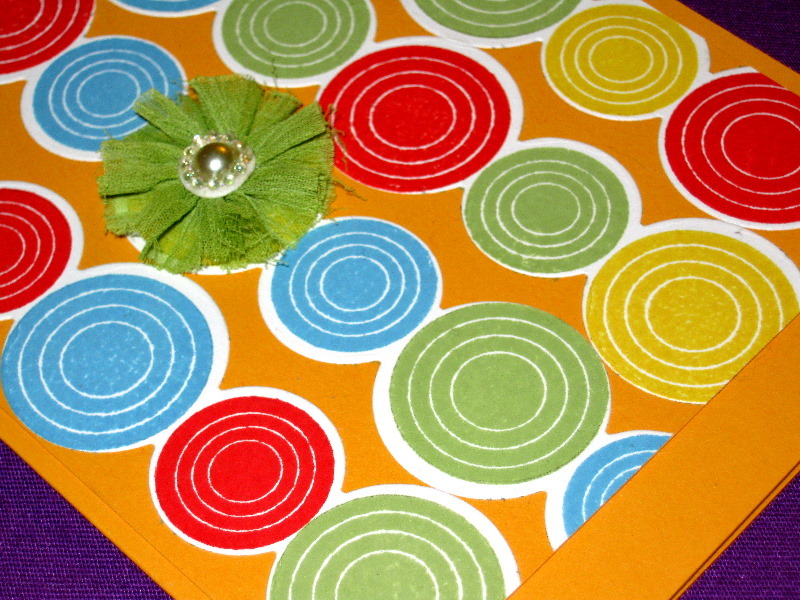 I cut a 4″ x 5″ mat from the 12″ x 12″ sheet I had printed and used the Martha Stewart Crafts “Optic Dot” corner punch to take the corners off of my mat. 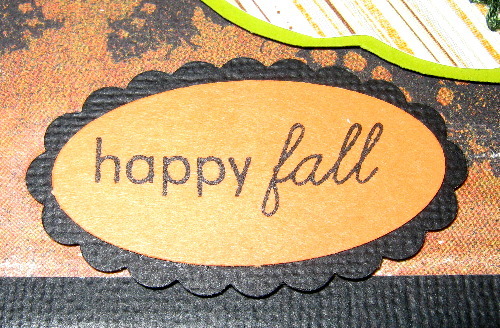 Rummaging through my stash, I found a terrific Stampin’ Up! 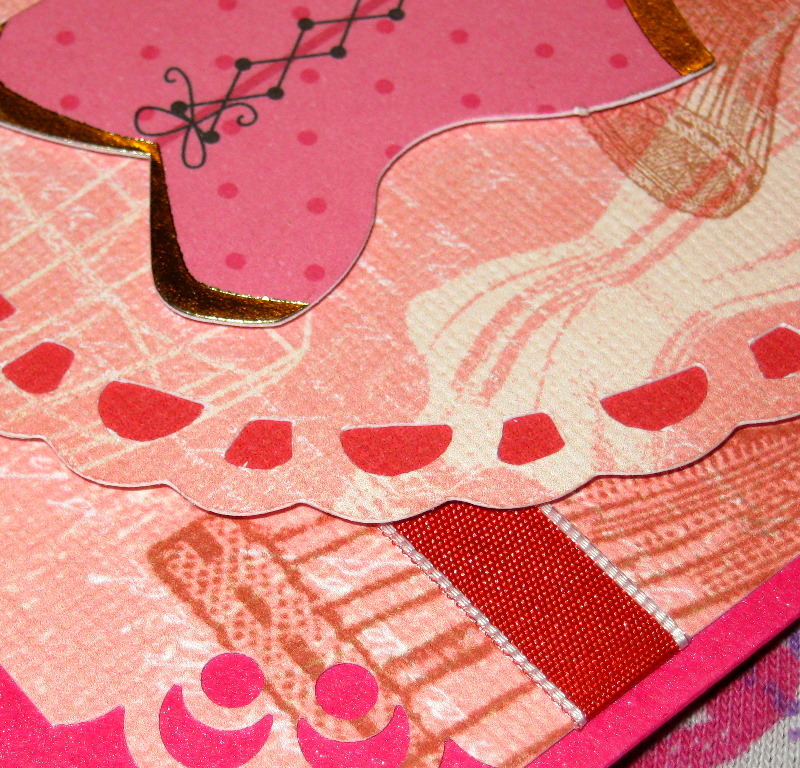 edged ribbon in Riding Hood Red that really went well with the design of the card. 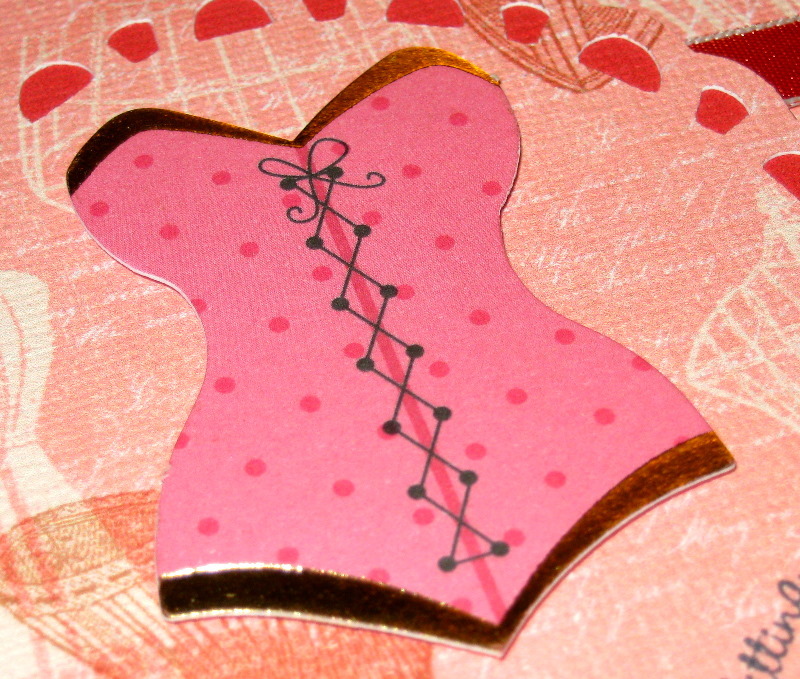 The corset die-cut is from a set of foiled elements by Kanban Arts. The sentiment is from a Stampin’ Up! set called “Chic Boutique”. The end result is a bit intimate and definitely boudoir-ish. I think it will make a great general purpose “girlfriend” card. With a little adjustment it would also make a great invite for a bachelorette party (if I may say so). Posted on April 28, 2011 by Albert G.
Today’s card project is made from some of the latest Papertrey Ink goodies I added to my ever-multiplying collection. I immediately fell in love with one of the newest steel dies that Papertrey Ink seems to excel at: Simple Circles Border. This great steel die works with almost any embossing/cutting platform familiar to crafters. It measures 1″ x 7 3/4″ and offers a great deal of flexibility in how you might want to incorporate or modify this design into your projects. 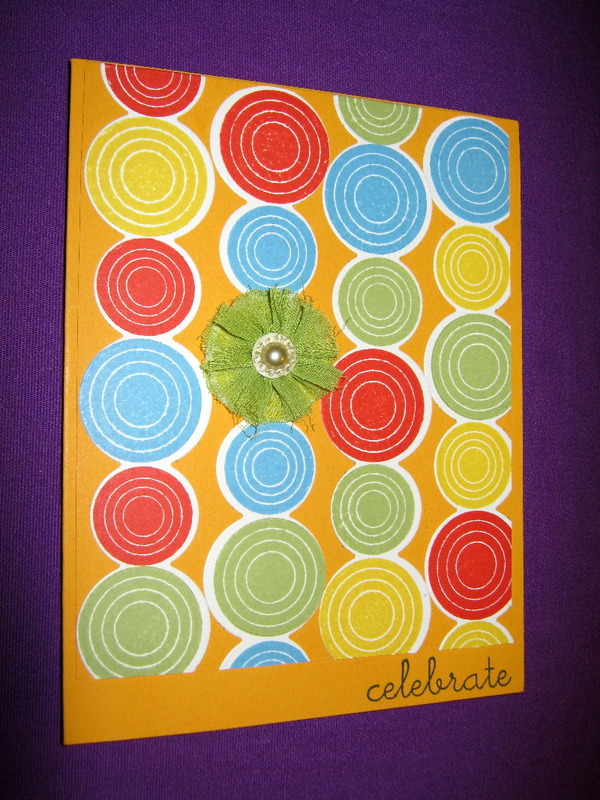 I chose to use it with a coordinating stamp set called “Boy Basics: Simple Circles” (from PTI, as well). My thought was to use the die cut image to create the actual background for my card. Using some plain white cardstock, I ran the die through my Cuttlebug four times to create four strips for my card background mat. 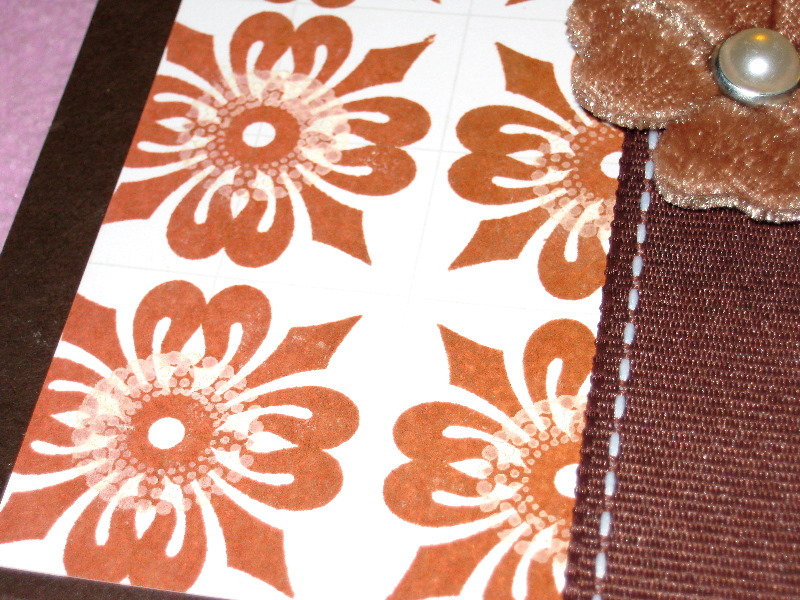 The base cardstock is from Papertrey Ink’s Perfect Match cardstock line in a color called Summer Sunrise. 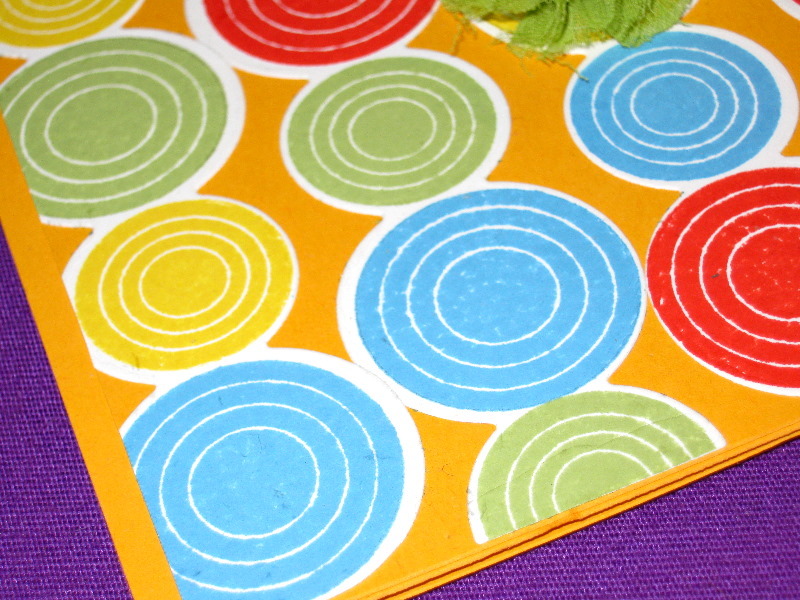 I also used a 4″ x 5″ piece of the same colored cardstock as a mat to adhere my die-cut strips to. After playing around with how I wanted to orient the strips on my card, I chose to alternate the half-circle end vertically–one starting at the top, the next on the bottom. Next, I grabbed one pair (small and large) of the clear acrylic stamps featuring a circular bullseye effect and several inkpads and played around with colors. 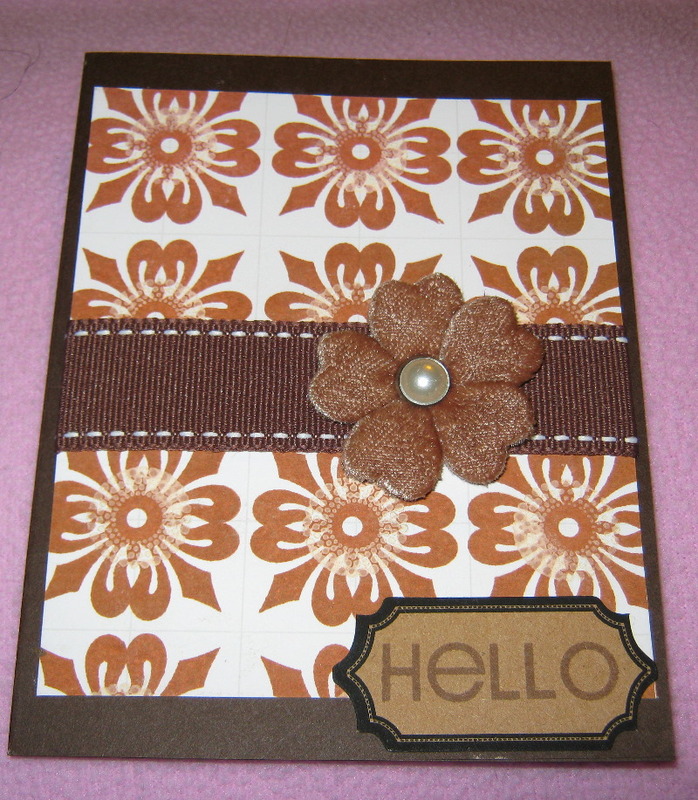 In the end, I used Stampin’ Up! color ranges in: Daffodil Delight, Wild Wasabi, Marina Mist, and Poppy Parade. I used a tulle, pearl, and crystal fleurette from Prima Marketing on one of the circles to break up the pattern a bit and offer another visual interest point. 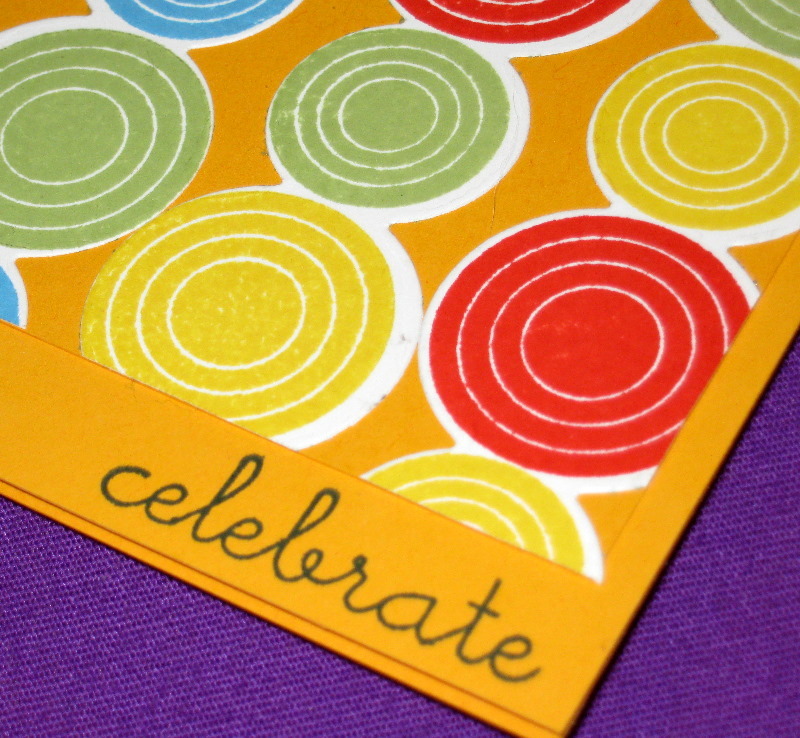 The result is a bright, cheery card that just kind of screams “celebration” (hence, the appropriate sentiment). I think this would make a lovely birthday or party announcement. My mind is so full of ideas for incorporating this die and stamp combination into many different projects. 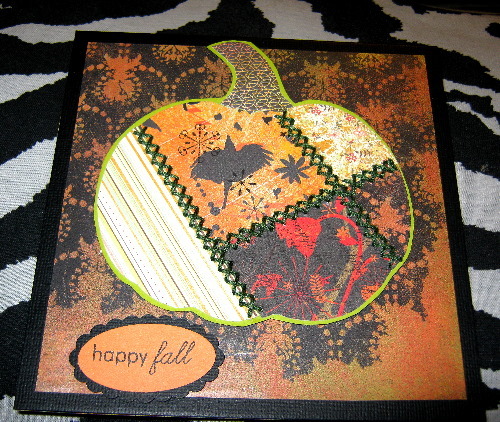 Posted on October 15, 2010 by Albert G.
Today’s card project is decidedly Fall in theme and feel. I originally was setting out to make a Halloween-specific card, but the more I worked with colors and paper selection–it became more vintage and retro. I originally was going to use the paper piecing (the patchwork pumpkin) to create a goofy jack-o-lantern that I was going to name Franken-Pumpkin (ergo the “stitch” marks). In the end, it is a much more muted and elegant affair–and I’m okay with that. This is also one of the rare times I make a 6″ x 6″ card. 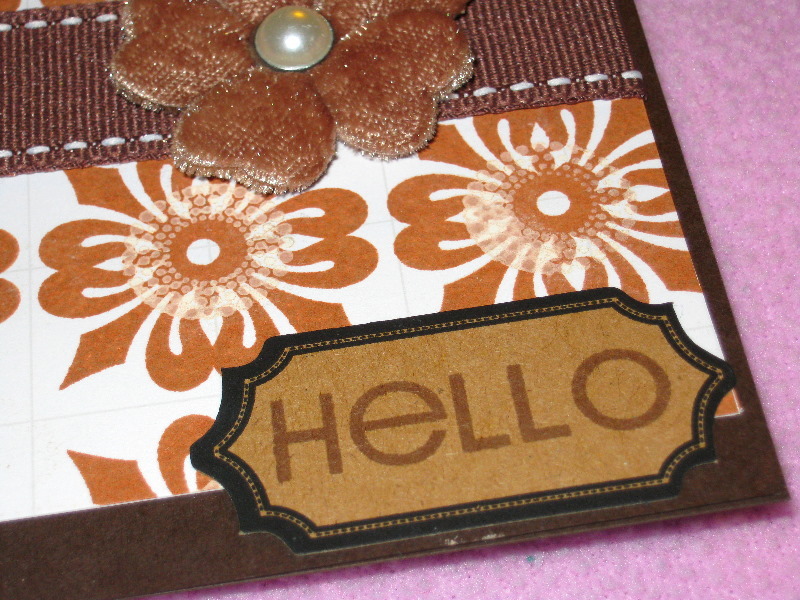 The base cardstock (6″ x 12″) is Bazzill textured cardstock in Raven, which was scored at 6″. The scalloped portion of the sentiment is Bazzill as well. The sentiment oval is Stampin’ Up! 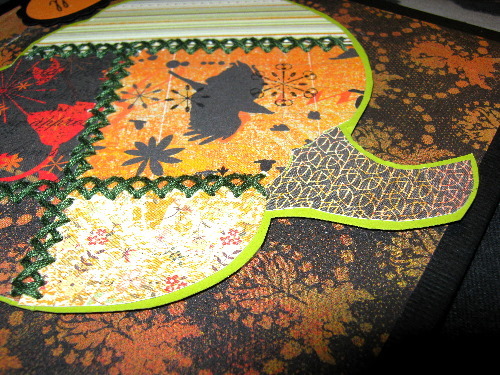 cardstock in Peach Parfait and the base pumpkin shape is Papertrey Ink Simply Chartreuse cardstock. 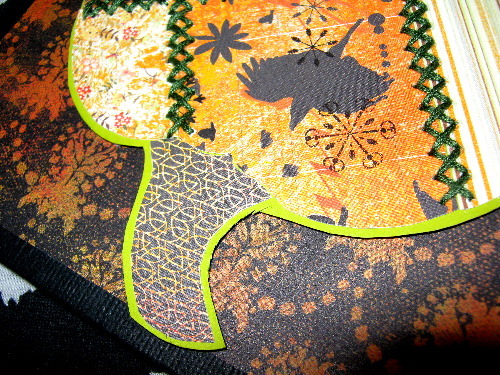 All of the other paper used in the construction (patchwork pieces, mat, and inside sentiment block) are from Memory Box’ “Blackbird” collection. Once I picked the decorative papers I wanted to use, I cut them down to my template sizes and adhered them to my base cardstock. I highly recommend that you glue your patchwork pieces together on the base cardstock before you start worrying about punching and stitching. 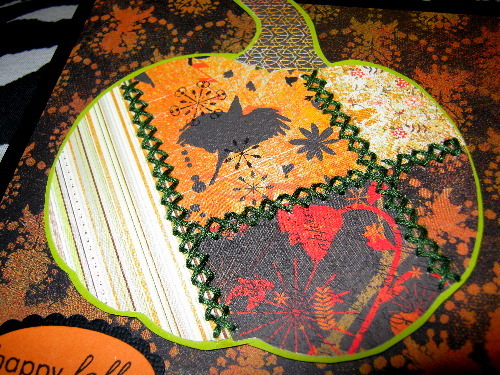 Once my pumpkin was together, I used a paper piercer to punch out my stitching holes. You need to think this out a bit and pay particular attention to where your stitches will intersect with one another. 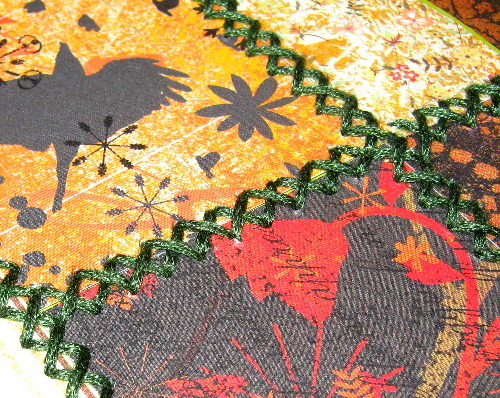 After my punching was complete, I used a Bazzill needle and stitching floss in a forest green color. The beginning and end stitches of my floss are simply taped to the back of my pumpkin. I used a simple stitch pattern and the results are quite effective I think. 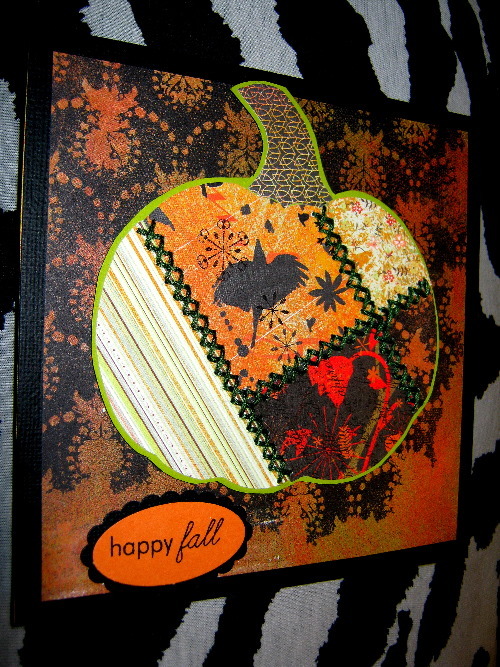 I used Stampin’ Dimensionals to adhere the finished pumpkin to my cardfront–giving it a bit more depth and interest. 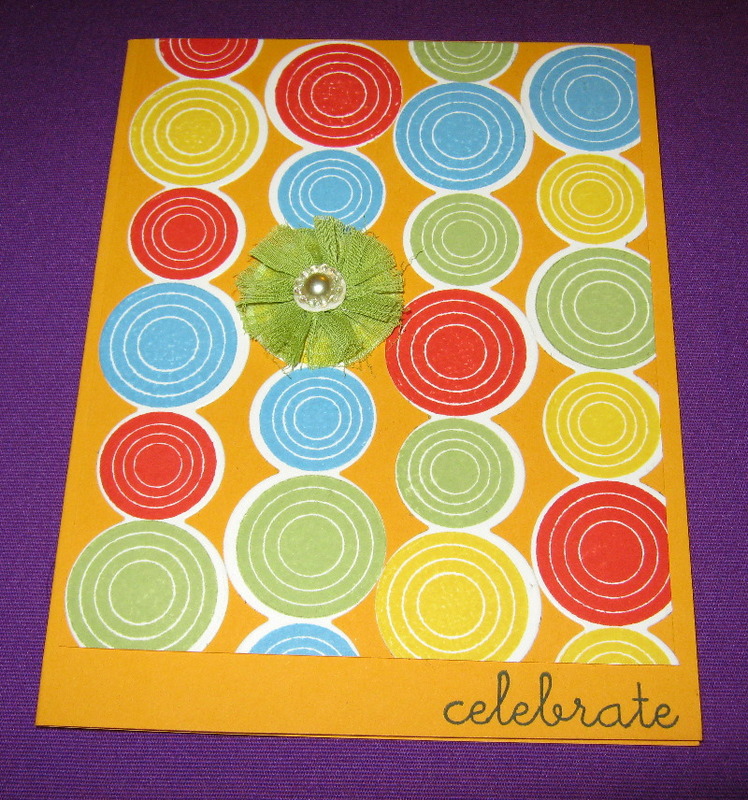 Then sentiment medallion was created using Stampin’ Up! punches (oval and scalloped oval) and the actual sentiment is from a Papertrey Ink stamp set. I used Stampin’ Dimensionals again to elevate the medallion. 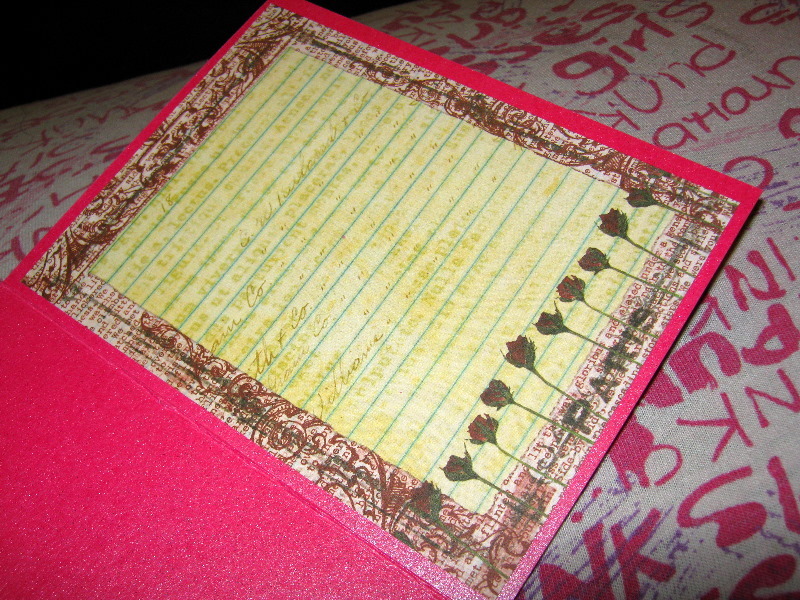 For the inside of the card, I used an entire 6″ x 6″ block of Memory Box paper. 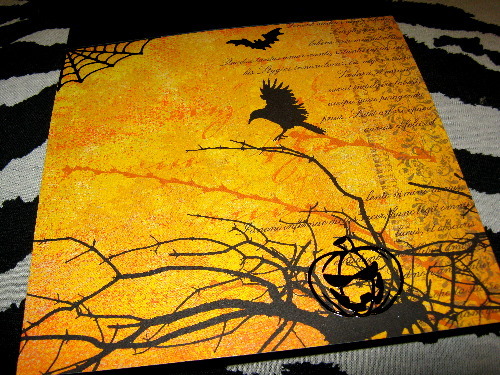 I embellished it with the spiderweb, jack-o’-lantern, and bat using a Sakura Glaze pen in black. In this instance, I think the inside is just as fun to look at as the front. Well, that’s it for today! I hope the air is nippy where you are (and that you have a blanket to cozy up with at night while you watch the leaves fall from the trees). I hear a Giveaway might just be on its way…hmm.